The Pound dropped hard yesterday as UK Services PMI missed the expectation (50.1 vs 51.1). Furthermore, the fear of a possible ‘no-deal’ Brexit isn’t helping to build a positive market sentiment. This bearish momentum could drag on until we get any kind of positive development regarding Brexit. There is no economic data coming out of the UK today, however, there are multiple figures due out of the US later this afternoon that could impact the Cable. 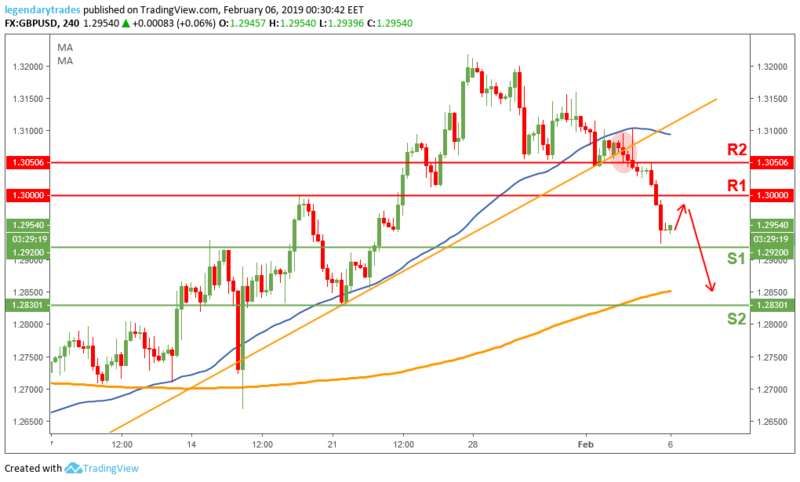 The Sterling broke below the 1.30 psychological key support yesterday and headed to test the 1.2920 support level (S1). Today’s price action confirms the end of this recent bullish trend and a possible trend reversal might start to form. 1.30 (previous support) should act as a resistance now in order for the bulls to keep the pressure on the bears. A break below 1.2920 could take the Pound towards 1.2830 (S2) to test it.